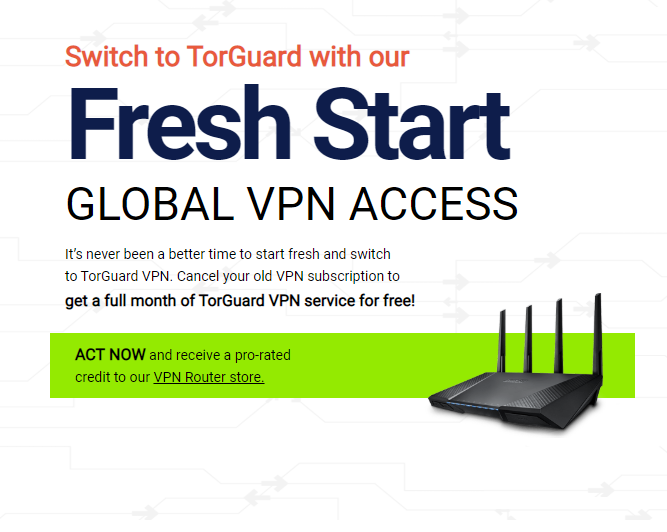 Now is the perfect time to switch to one the best VPN services with TorGuard’s new Fresh Start promotion. TorGuard has been nominated as the best VPN to use by some of the most prestigious review sites on the net, like Wired, Wirecutter, and IGN. By canceling your old VPN subscription with your old provider, you can start fresh with TorGuard VPN and get an entire month free. Or if you need a little convincing, just send us your last bill and you can get a free 7 day trial! How to Switch to TorGuard VPN for Free? It’s easy to switch to TorGuard VPN. Simply email [email protected] your last VPN bill. Once you do this, the TorGuard customer support team will verify your bill and you’ll get 7 days free of unlimited TorGuard VPN access. Once we’ve convinced you that we really are the best VPN, and you cancel your old VPN subscription, all you have to do is email us showing proof of a VPN cancellation. Once verified, you unlock an entire month free with TorGuard VPN services. Use Previous VPN Subscription for Pro-Rated Router? If you’ve already made a long term commitment to another VPN, you can recoup your losses by receiving a limited time pro-rated credit to the TorGuard VPN router store. This means you can use your unused time from your previous VPN package and the cost associated with it, to buy a brand new VPN router from our pre-flashed VPN router store. VPN routers are one of the best ways to ensure 24/7 VPN protection in your entire house or on the go, so don’t wait long! We’re confident you’ll stay with TorGuard, since we have the best zero logs policy on the net. Not only that, but we’ve made sure our VPN is fast for torrenting, gaming, and even streaming. It sounds too good to be true–to claim to have it all, but TorGuard VPN services is a product first company–and our results show the fruits of our labor. We’ve put all of our effort into making the most secure VPN possible, with AES-256 encryption, multiple kill switches, IP leak protection, customized script support, and more. TorGuard is available on PC, Mac, Linux and mobile devices like Android/iOS with full support for OpenVPN/L2TP/IPsec/SSTP/AnyConnect on all OS. We care about our customers and privacy worldwide, and that’s why we’ve designed the most secure VPN in the market. And now with this promotion, it’s time for everyone to unlock the TorGuard VPN advantage.